After spending nearly 30 years as a middle school teacher, author and poet Larada Horner-Miller now teaches workshops based on her experience writing two memoirs. Her first memoir, This Tumbleweed Landed (2014), celebrates her Colorado upbringing in the 1950s and 60s. A Time to Grow Up: A Daughter’s Grief Memoir (2017) is her newest book. 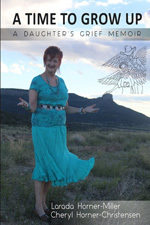 You’ll find Larada on LaradaBlog, Larada.wix, and her SouthWest Writers’ author page. 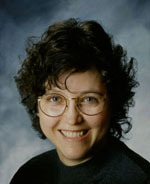 Connect with her on Facebook and Twitter. How would you describe A Time to Grow Up: A Daughter’s Grief Memoir? Through a series of poignant poems and reflections, I celebrate my parents’ legacies, mourn their deaths, and offer words of comfort and inspiration for others who are grieving. I tried to put this book together the year after my mom died, but the grief was too fresh. I had to wait three years before I could tackle it again. I also added a section about the loss of my dad, and I was surprised how I handled his death with very little writing. But I was my mom’s primary caregiver, so I focused on her. During the process of writing A Time to Grow Up, were you afraid of revealing too much of yourself in the work? Yes, I was concerned about revealing too much, and I had to choose not to include some things and to include others. I had to include my recovery story because it is the foundation of who I am today. I worked on this book for over a year. I added parts and then took a break. It was so intense that it took my breath away if I worked on it for too long a stretch. I put it together in Scrivener, printed it, and then went through it line by line. I also had it professionally edited. I found a great editor who loved the book and felt it was a sacred trust to edit. The cover was an experience. I knew it had to reflect the inner message of the book—I grew up to be the woman I always wanted to be. At first, I was going to use a stock photo, but my Facebook supporters who knew my other work said I had to have a picture from where I grew up. So a girlfriend took a picture of me with Saddle Rock in the background. She also inspired the idea to put a drawing of my mom and dad as angels on the cover. I worked with someone from fiverr.com who didn’t understand that I wanted the drawing to be more opaque (more like it was in the clouds), but we were running out of time, so I took it as it was. I plan to fix the drawing in the future, but right now I like the cover. It’s the first one I didn’t do myself! How did you choose the poems and prose to include? Were all the pieces written specifically for this book? All of the poems were written specifically to heal—they poured out of me about six weeks after Mom died. I had no idea when I was writing them that they would end up in a book. The prose section came from journals I write daily. 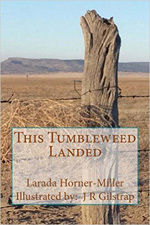 I used a combination of poetry and prose in my first memoir, This Tumbleweed Landed, and I loved how it turned out. Originally this grief memoir was only going to be a poetry book, but as I typed the poems, I saw the holes in information between the poems about my mom’s three-month struggle and death. I knew I had to flesh out the gaps. I did that by consulting my journals, and then the prose became an integral part of the book. Do you remember what inspired you to write your first poem? I didn’t write poetry as a child—it felt so foreign to this country girl—and didn’t understand it in high school. I was an English teacher in my late 20s before I wrote one line of poetry. I do remember the feeling that came with that first poem—complete freedom of expression. Being creative means that I tap into the authentic Larada and make something that expresses a part of me. It can be my writing, graphic designs I do on the computer, a floral arrangement, a dance with my husband—creativity has lots of avenues of expression for me. Poems begin with a line or an image. I just wrote one this last week inspired by an exercise session. I have lost some weight and looked down, and my belly is shrinking. Also I applied for Medicare and am turning 65, and the poem then became about all the changes that are going on in my body and spirit in growing older—so I embraced my elderly Larada. It was quite a process! I wish I had pursued it wholeheartedly instead of as a hobby. I wrote two of my books more than thirty years ago and put them away and did little with them. I wish I had jumped on the publishing wagon and really believed I was a writer. Today I know I am a writer! I am working on a delightful project—writing the authorized biography of Marshall Flippo, the world-famous square dance caller who turned 90 years old last September. We have weekly phone interviews, and I have over 37,000 words already towards the book. We hope to release it in June of 2019. His life was one of absolute joy and laughter—I’d love to say that about my life at 90! Today writing feeds my soul and spirit. I am retired and have the luxury of choosing what I do now, and I wouldn’t want to do anything else with my time. Also, I have been presenting memoir workshops at local libraries. I provide informative handouts, time for participants to write, and lots of resources. I used to think watching my middle school students write was the pinnacle, but I can tell you now that watching adults write is even better! Find out more about Larada and her writing in her 2017 interview for SouthWest Writers.